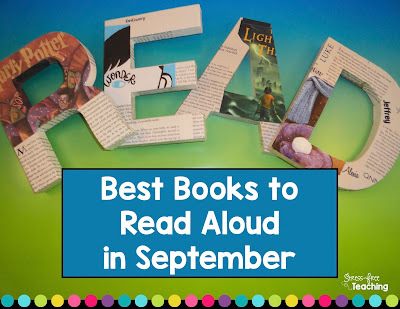 It is so very important to find great picture books to start off your school year, however science is often times put off to the side for lots of different reasons. However, I want to help you find some great picture books-both fiction and non-fiction that can springboard your science lessons! Grabbing a science themed book that you can also use in your language arts lesson is one of the best ways to tie in the two subjects! The best part of a picture book can teach our students about the world around us as well as introduce a science concept or principle showing that science is all around us. Use a story to bring a science concept to life or give them the background knowledge they need to make connections! 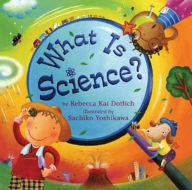 For a K-2 introduction to what science is all about is, What is Science written by Rebecca Kai Dotlich. This book has great picture clues to show primary students that science from planets to rocks, to hurricanes, to animals...It gives you a way to start science curiosity and the springboard to asking questions about the world around them! For 3-5 picture book, I love the book The Most Magnificent Thing by Ashley Spires. It is about a girl and her dog who want to make the most magnificent thing. Why I love this book it shows her frustration and the fact that she quits because of it. It can give you a great opportunity to teach perseverance, perspective, and positive growth mindset. As our older students have to work as a team to complete experiments it is important to set the stage for what it might take to succeed! 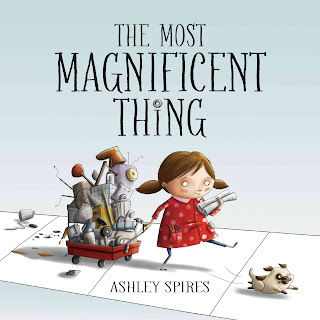 Not sure about other great picture books to use for your science lessons...here is a great post that shares over 100 perfect picture books for you to think about. Head on over to Geek Wrapped for their list of Science Books for Kids! 2. I love Up In The Garden and Down In The Dirt by Kate Messner. It gives an overall perspective of everything that happens in a garden over the course of a year. 3. I also love getting the littles outside so anytime I can read a story about colors, letters, or even numbers that is a bonus. I love Planting A Rainbow by Lois Ehlert. 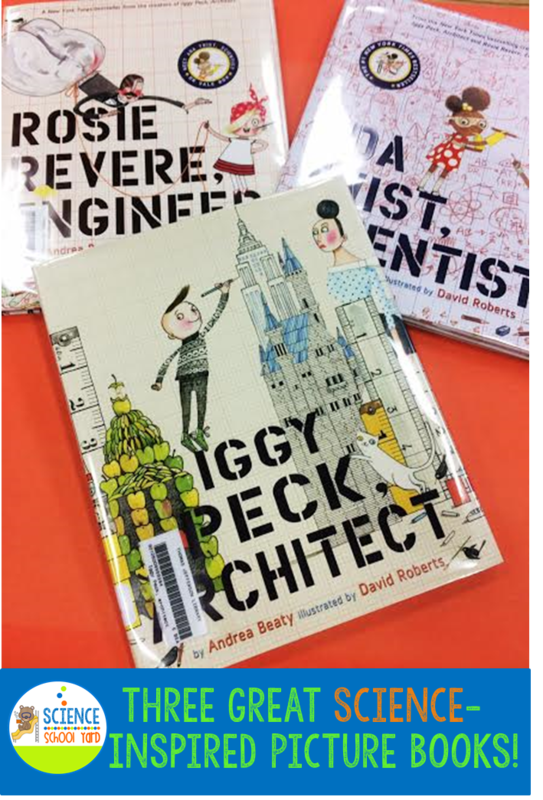 I also want to share with you my favorite STEM books that can foster building with K-5th graders. 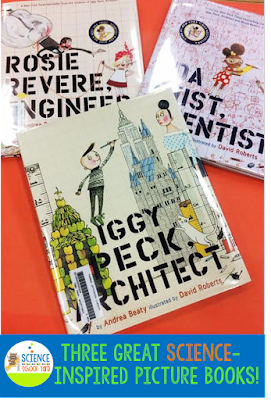 For STEM activities for littles, take any nursery rhyme or fairy tale and tie it to STEM, but for older kids take any of Andrea Beaty books such as Ada Twist Scientist, Rosie Revere, Engineer, or even Iggy Peck, Architect. Looking for more picture book ideas check out my friend Kim, over at Stress-Free Teaching for some more great back to school picture book ideas! It is exciting to plan for the new school year. 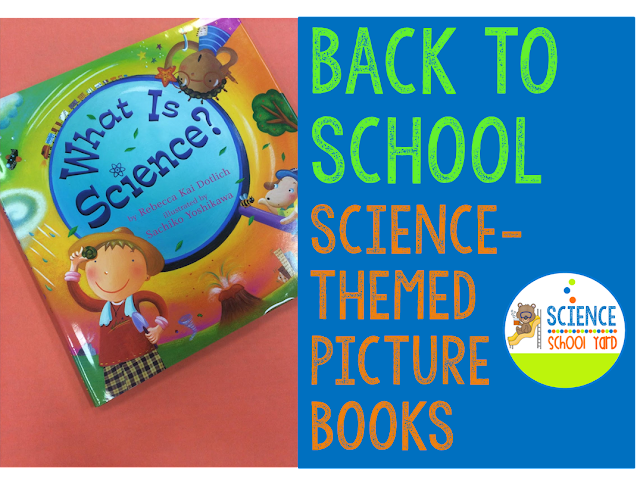 One of my favorite products for the back to school season that helps me tie in a ton of great picture books along with a holiday theme are my STEM seasonal packs! Amazon is hosting a Black Friday Sale this Friday, and I didn't want them to be the only ones with great deals...Black Friday Sale On My STEM All Year Pack Here! (For checking out my blog is is up on sale today already!) The lowest price of the year! The price goes up Saturday so get the 32 STEM Activity Pack today! This deal is like getting two packs free! 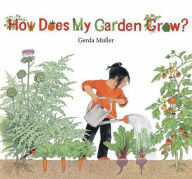 Great with any seasonal picture book! Let the STEM fun begin!